Home ⎢What exactly is meant by "Rebreather Friendly"? What exactly is meant by "Rebreather Friendly"? “Rebreather Friendly” dive centres—what exactly does this mean? With emerging technologies becoming more mainstream in the diving world these days, more and more people are making the investment in rebreathers. Everyone knows the advantages of these pieces of kit—extended dive time capabilities, reduced gas usage, quieter and less obtrusive to the aquatic world, etc. But are dive operators thinking on the same lines? Do they see the potential of increased business opportunities? 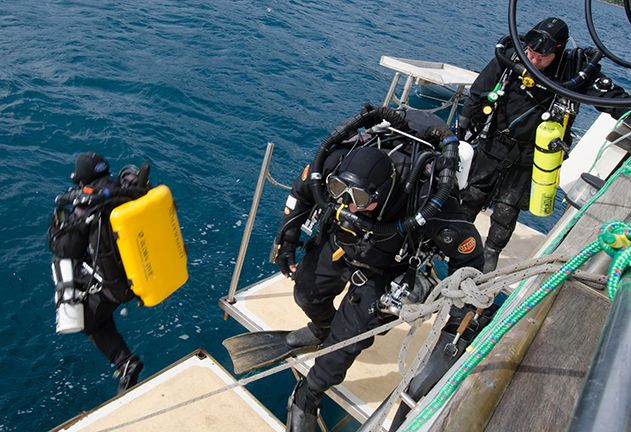 Rebreather divers enter the water. Photo by Pete Mesley. With the advent of PADI’s recreational closed circuit rebreather (CCR) dive programmes announced in late 2011, it was anticipated that there would be a tidal wave of interest by the diving public learning on rebreathers to capitalise on the advantages of rebreather diving, and dive shops would be able to offer rebreather training and fully-supported CCR operations to their clients. It turned out not to be such an easy thing. To be able to properly support a CCR diver, a dive store would need to invest heavily not only in plant gear (O₂ gas boosters, blending panels, Sofnolime, CCR tanks, etc) but also have to increase their staff training levels, anticipate higher risk in accommodating rebreather divers (rebreather diver fatality statistics were really high for the first 12 years of their entry into the main diving arena) and also change their diving model. Why would a dive store want to accommodate higher risk, higher maintenance divers wanting to spend longer time in the water, be guided by rebreather dive guides, which would increase the dive stores costs? Now that the dust is fully settled, just how easy is it to plan a dive holiday where you can take your rebreather? Recently, I tried to organise a trip to a tropical location. One of the things that I have learnt when corresponding with dive stores in different countries is, what they say and what actually happens are two different things. I contacted a dive store (whose name is irrelevant because I have come across the same circumstances in many other shops) and enquired about diving with them on my rebreather. They said that this was not a problem, and stated on their website that they were “Rebreather Friendly”. When I inquired a little more, I learnt that they did not have any oxygen (apart from medical emergency O₂), nor any Sofnolime, nor had any CCR tanks, AND all dives would be limited to one hour. So I was a little confused. This was not exactly the “rebreather friendly” I had in mind. What they meant was unknown. Maybe a rebreather had come to dive with them in the past, brought all his or her own gear and dived within the parameters of the dive centre's boat. So, I guess the store thought that they were “Rebreather Friendly”, but that is where it stopped. I ended up not diving with that operator nor heading to that destination. With increases in rebreather diver numbers globally, this is becoming an all too familiar situation. On another occasion, a dive operator responded that they would gladly accommodate my group on rebreathers with longer dive times, but I would have to charter the dive boat with a group booking. On top of that, I would have to bring all my own gear, CCR and stage tanks as well as arrange my own consumables (O₂ and Sorb). So I guess this was accommodating us... in a way. Should dive stores make the investment to entice rebreather divers? Sounds great, but then why would they want a group of high maintenance divers who need more gear than most, want more time in the water, need the dive guides to be able to spend longer periods in the water and at greater risk? Make no mistake, the numbers of advanced and technical divers is increasing globally. This increase in numbers will put more pressure on dive operators. But then again, the majority of the dive market is made up of recreational “holiday divers” who will do 10-20 dives a year, while on vacation. Their wants and needs are minimal. Everyone is happy if they do a 35-45 minute dive following a guide pointing out a few fish. Operators know this and have embraced it by offering two-tank dives in the morning and then a new group doing a two-tank dive in the afternoon. Everyone will rent their gear. Their staff all know how the gear works. Its SIMPLE, it WORKS, why change it? What is good to see is that it is not all doom and gloom for the rebreather diver. There are dive operators (slowly emerging, scattered round the world) who have bitten the bullet by offering proper rebreather support and making it part of their mission to offer specialised, experienced diver diving products, which encompass all the advantages of rebreather diving. It is anticipated (and also proven over time) that CCR diving will always be a niche market and not for the masses (recreational holiday divers). Dive operators who have embraced this technology will grow, but at the same time, the majority of the recreational dive market will keep doing what they have been doing. Maybe operators will change their minds if more pressure is put on them by customers (you). It is much like the chicken and the egg scenario! So what is my definition of “Rebreather Friendly”? Here are some thoughts. I think if an operation offers the following basic products and services, they would be well on their way to supporting CCR divers. • Keep a range of CCR dive cylinders for hire (most CCRs use 3-litre Fabre steel cylinders) and some use the smaller 2-litre Fabre cylinders. • Be able to offer high pressure oxygen fills. It is not essential to have a booster pump, but high pressure O₂ is a must (decanting is another option, but higher numbers of O₂ tanks are needed for this). • Keep personnel trained to handle high pressures of O₂ (this is essential for any operation to keep safe and minimise problems). • Offer Sofnolime fills and have a minimal stock level of sorb. • Be able to accommodate CCR divers on any charter, on any given day. • Be able to be flexible enough to offer longer dives for CCR divers. It is not difficult to plan to get CCR divers into the water first, and even if they do 90-minute dives, the single tank recreational divers can take part of their surface interval at the same site. • It is preferably (but not essential) to have dive guides on CCR. This would be the most challenging of requirements. As long as the CCR divers are suitably experienced and get a detailed dive briefing, CCR divers (most of the time) do not need guiding. If CCR divers want a guide, then it will fall under normal diving times and requirements, unless previously arranged, and additional charges will incur. • Keep a supply of stage bailout tanks available for hire: 5-litre (40cf) tanks are the norm (most just require stage rigging and people can use AL80s, if need be, which are in plentiful supply in any dive operation). • There is no need to keep spares for CCRs or other consumables (O₂ cells, batteries, etc), but it would be nice. These are the things that CCR divers can easily take with them, to be as self sufficient as possible.